Crude Oil Trade Resource Directory contains Oil, Gas and Petrochemical companies from over 90 countries. 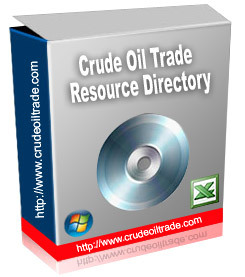 With establishments covered from over 90 countries, Crude Oil Trade Resource Directory is a unique Global Oil and Gas Directory. The database in this directory is strictly permission based and is compiled with close cooperation from the participating companies. This is our sincere attempt to collate extensive database of Oil & Petroleum companies, all entries to this Directory are true and correct as provided to us by participating companies. We have complied and provided provide quality information for all those interested in the Oil & Petrochemical and related industry worldwide. The Crude Oil Trade Resource Directory contains more than 8,000 (Eight Thousand) corporate profiles of oil, petroleum, petrochemical & gas companies including their complete contact information, contact name, activities and more. Hope you will find this resource useful as it may bring manifold increase to your business.